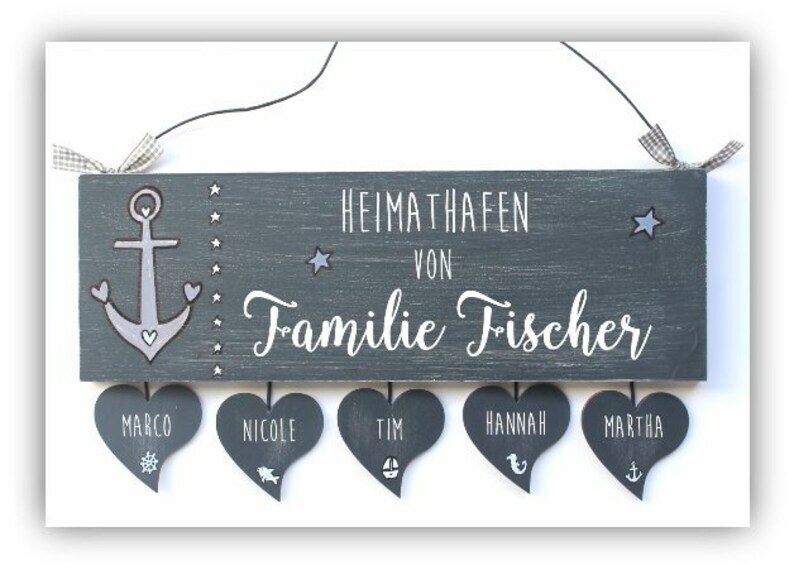 Wunschschriftart für die unterste Zeile Hauptschild? Door Sign Wood (Spruce 18 mm) Motif Maritim-desired text and free choice of font including heart pendants, which bear the first names and are decorated with small maritime motifs. Rauchblau primed, reprocessed for the trendy shabby look, hand-painted and hand-labeled in white and color. Labeled "Home port of" in the font shown, including in your desired font "family + wish name". For double names/very long names we put the word "family" next to the word "from". In price and size included are up to 6 hearts-if you need more contact us please. We are happy to prime * * Also in other background colours * * such as light grey, Lind and dark green, dark blue, Bordeaux, black etc. A message about this is sufficient for the purchase. Selection table for the possible fonts can be found in the product photos. The paint/lettering is provided with high-quality clear lacquer (Matt) and is therefore best protected against atmospheric influences! This motif is also available on Slate, see the corresponding offer in our shop.